Want to know the way on how to copy and paste on Facebook? The following post is dedicated to you as in the post you will read detailed instructions on how to do that. When we talk about the best social networking site, the Facebook is a people’s choice. Accessing a Facebook on the various platform is simple even a kid studying in an elementary school can do that. But on the other hand, the various features offered by the service is really tricky to use, especially copy-paste the content from the post. Yesterday my grandmother asked me few questions back to back, i.e., How do you copy and paste on Facebook? And How do I copy and paste on Facebook? I found this question to be useful, and a thought comes to my mind that there might be other grandmother’s and grandfather’s looking for an answer to the same question. 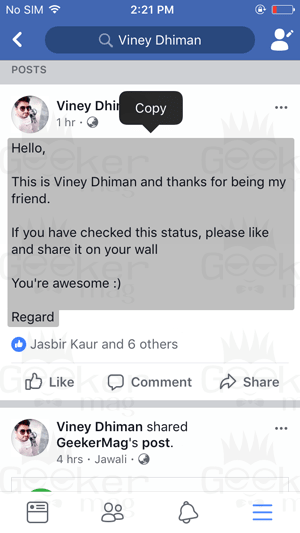 First of all head over to the Facebook post or thread from which you want to copy the text. After that, put the cursor like in front of the text you want to copy. Now Left click + Hold it + Start dragging. Keep dragging until all the text which you want to copy is not highlighted. Once done, release the left click. Now make a right click and from the context menu select ‘Copy.’ Alternatively, you can also use CTRL + V keyboard combination for the copying the text. This will copy all the text to the clipboard.Now you can paste the text into “Write something here” section if you want to repost it. You can also paste where ever you want. 2. 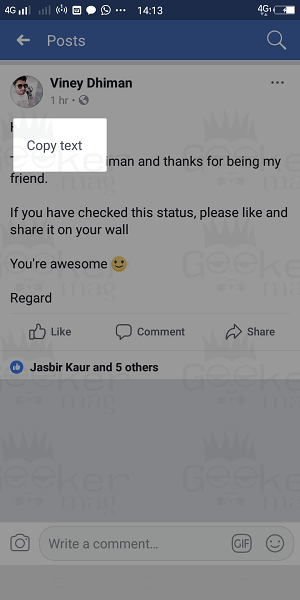 Head over to the Facebook post from which you want to copy the text. 3. Tap and hold the text area. In case of Android, ‘Copy text‘ option will appear. In case of the iOS device, ‘Copy‘ option will appear. Now you need to tap on the same option. And this will copy the text to the clipboard. Paste the text where ever you want. Here is a quick gif for Android and iOS devices. 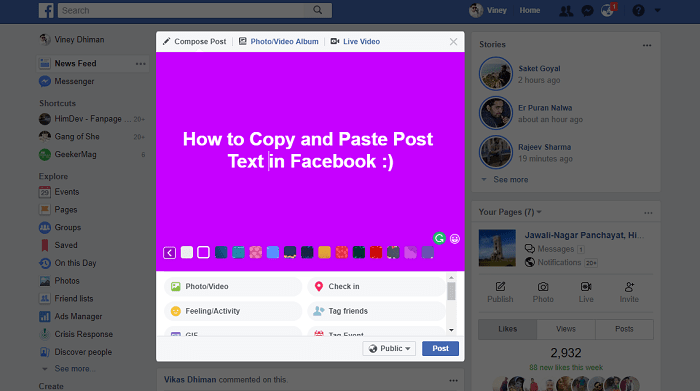 So this the tutorial on how to copy and paste Post on Facebook for all the platforms. I hope you find this blog post useful.